Need a Gardener in the Brinkin area? Jim's Gardeners Brinkin are gardening professionals and are here to help - if our schedule permits, we can even offer same day gardening services. Contact your local Jim's Gardeners Brinkin on 1300 191 565 or you can Book a Gardener online for a time that suits to have garden expertly cared for, or simply schedule a free, no obligation quote with your local Brinkin Jim. Of course prices and services for Gardeners can vary depending on the size, length, slope and overall state of your garden to be cared for, therefore it's essential that one of our local Jim's team visit the garden first to ensure an accurate assessment of required gardening services, and therefore an accurate estimate of costs. You will have the reassurance of a written quote, plus our gardeners offer a money-back guarantee. Importantly, all Jim's Gardening staff have a current police check, and are fully insured and trained, offering a 100% money-back guarantee. So rest assured, it's time to get your weekends back, spend quality time with family and friends, perhaps socialising in your garden, rather than working in it. Remember, we our expert gardeners in Brinkin can provide entire lawn mowing, maintenance, weeding & edging, garden rubbish removal, gutter cleaning,tree trimming, shrub and hedge pruning through to landscaping and irrigation systems. 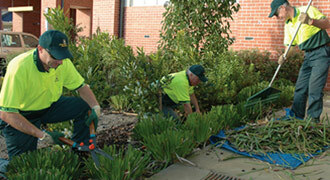 So please call Jim's Gardeners Brinkin on 1300 191 565 now or Book a Jim's Gardener online, today. If the garden is becoming a bit of chore, especially in this weather, let your local Jim's Brinkin Gardener take care of the garden, while you spent your time however you please.... perhaps at the local Golf Course? Cafe? Shops.....?